The trams aren’t just a tourist attraction, though. With lines stretching as far afield as Algés in the west, coupled with the city’s notorious hills, they’re equally popular with locals. It’s not difficult to ride the trams in Lisbon, but as with most public transport systems, a bit of knowledge and preparation goes a long way. Here’s how to do it. There are five tram routes in Lisbon, all of which go through the downtown area. The numbered lines are all followed by the letter ‘E’, which stands for electrico (electric). While the historic #28 tram between Martim Moniz and Campo do Orique is the most popular, many visitors will also find themselves on the more modern #15, which runs along the river all the way to (and slightly past) Belém. Both routes can get extremely crowded in summer, especially at weekends. For a quieter, more relaxed trip, take one of the other lines. The number 25 tram, for instance, also finishes in Campo do Orique, taking in the Estrela Basilica and a few more local neighborhoods, before finishing with a short run along the riverside to the base of the hill at Alfama. For a shorter journey, jump on the #12. This tram loops around the heart of the old city in just 20 minutes, going past the cathedral, the gorgeous Santa Luzia viewpoint, St Anthony’s church, and more. Unlike the other routes, this tram only travels in a single (clockwise) direction. Finally, the #18 follows the river for a mile and a half from the Cais do Sodre interchange, before turning north before the April 25th bridge, and finishing up at the Ajuda cemetery. It’s often the least busy of the tram routes, as there are fewer tourist attractions along the way. All lines have the option of buying a ticket on board, although how you do so depends on the tram. The price is per ride, so it doesn’t matter whether you’re going one stop or all the way to the end. On most routes, you simply hand your money to the driver as you board, while the larger, more modern articulated trams on the #15 route have ticket machines inside. Note, however, that there are several disadvantages to buying tickets this way. On busy routes, the front of the tram can be very congested, making it difficult to deal with money and tickets as you board. Using the machines is slightly easier on the #15 trams, but they don’t give change, so you may end up paying more than necessary if you don’t have the exact amount. Speaking of paying too much, buying onboard costs twice as much as using a pre-purchased ticket or pass. To save money, time and hassle, go to a metro station, marked kiosk or post office ahead of time, and buy a day pass or preload a Viva Viagem pass with as much credit as you need. On the vintage trams used on the majority of routes, passengers board at the front and disembark at the rear. You’ll be unpopular if you try doing it the other way! On the larger #15 tram cars, passengers use all doors to get on and off. At busy times, wait until most people have disembarked before trying to get on yourself. In either case, if you’re using a pre-purchased pass, don’t forget to swipe it on the reader as you enter the tram. Even if you have a day pass, you’re still required to validate it on each journey. There’s no need to swipe again when you leave. 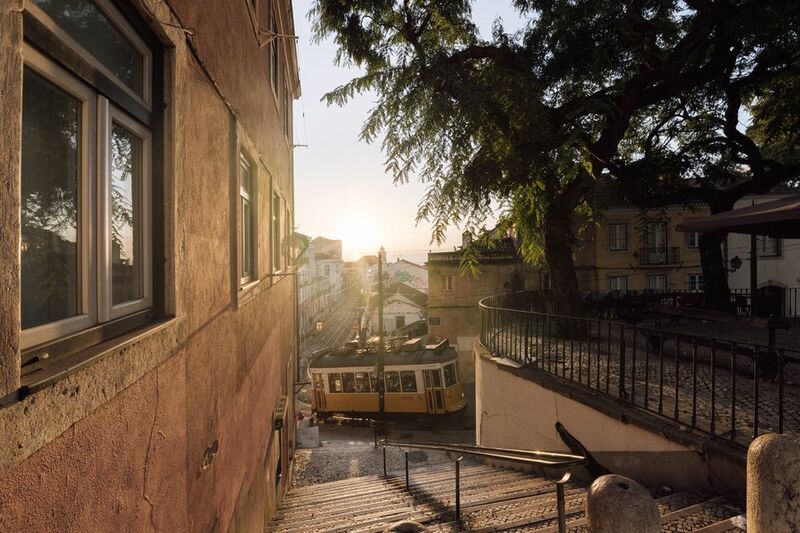 Due to Lisbon’s steep hills, elderly people often use the tram to avoid having to make the climb up and down the cobbled streets. On crowded trams, giving up your seat to pensioners is always well-received! The only real danger on Lisbon’s trams, other than the heat of an over-full carriage in summer, is pickpockets. They’re known to regularly operate on both the #28 and #15 lines, where the mixture of tourists and crowds presents a tempting target. Particularly on those routes, be sure to keep your valuables secure. Don’t put your wallet, phone or anything else you can’t afford to lose in your back pocket, and keep your bag or daypack closed and in front of you at all times. Be aware of people deliberately bumping into you, especially when boarding or leaving the tram. A trip on the #28 tram is often called a ‘must-see’ in guidebooks, and for an obvious reason – it’s an unusual and inexpensive way of getting a tour through the heart of one of the most beautiful cities in Europe. That popularity, though, comes at a price. In the height of the summer tourist season, it’s not unusual to have to wait up to an hour to be able to board one of the trams – which will then be completely full for almost the entirety of your journey. As well as being hot and uncomfortable, the overcrowding also makes it difficult to see or take photos of the cityscape that’s the main reason for your journey. There are no guarantees, but following these few tips will give you the best chance of a less-crowded, more enjoyable trip. Buy your ticket in advance. As mentioned earlier, it’s cheaper, and much easier, to just swipe a pre-purchased pass than mess around buying a ticket on a packed tram. Travel at off-peak times. The tram is busy throughout the day, but peak times run from around 9:00 a.m. until 7:00 p.m. If you can take your trip at night, or early in the morning, it’ll be a lot less crowded. Get on at the first stop. If you think boarding the tram at Martim Moniz is difficult, try doing it anywhere else in the downtown area. In summer, it’s practically impossible. The best tip of all: Strongly consider riding in the opposite direction. Rather than joining that endless line at Martim Moniz, start your journey at the other end, in Campo do Orique. It’s exactly the same route, with fewer people taking it. Get there by taxi, on the #25 tram, or enjoy the 45-minute walk from Chiado.